Another rig going to build. As build progressed more will be posted here. 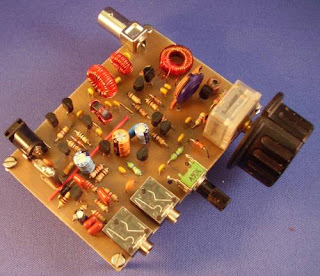 I bought a couple early ATS-3 and an ATS-3B kit, from Steve Weber (KD1JV) I built both rigs but I also have one complete kit for the early ATS-3 still unmade, it might be an ATS-3 or an ATS-3A I will need to check. Don't know if there much call or enquiry for a kit or if anyone is looking for one unmade? Finding out exactly what I paid for it but would have also paid shipping and customs (VAT and handling at least) from UK-US too, I expect. I would expect sell at cost. Will hold onto it otherwise. Having built a couple of Steve's rigs when I saw this I though I had to have a go. The initial ADC-40 needed some extra filtering due to problems with SWBC but the updates were done and Steve just emailed me about it. I have just printed off the PCB mask and will have a go at building this. The picture is a little blury but the sheet is fine (Steve includes a PDF on his page for you to create your own PCB). Ok first things first tested this on an old Advent 7062 laptop. The start to login was just over a minute and to login 26 seconds. I ran FREE AVG 8.5 as the anti virus. Note immediately post installation I had to add a couple of drivers to the install, SIS900 network card and AC97 sound card (it used XP drivers fine). The free windows 7 release client will be available until at least the end of July 2009 and they are not limiting the number of product keys, so there is plenty of time to download it. ADVICE GET A SPARE KEY NOW!!! But as everyone including Microsoft advise watch the dates. It will expire on June 1, 2010. Starting on March 1, 2010, your PC will begin shutting down every two hours. By then the full version will have come out you can buy it or just move onto something else. One thing I found the 512MB RAM module 701 eeePC comes with needs to be in place for the install, so keep it in place or put it back before you consider upgrading to more memory otherwsie the pagefile and hybernation files are created too big. Mine seems to run all the usual ham radio goodies fine and HRD defintely works. Now trying to get mine running off a 32GB SDHC card instead.